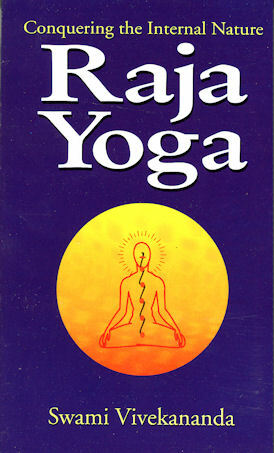 An important titles on the practice of raja yoga. From Vivekananda's original lectures in the United States. Rousing the Kundalini is the one and only way to attain Divine Wisdom. The rousing may come in various ways: through love for God, through the mercy of perfected sages, or through the power of the analytic will of the philosopher. Wherever there was any manifestation of what is ordinarily called supernatural power or wisdom, there a little current of Kundalini must have found its way into the Sushumna. Only, in the vast majority of such cases, the people had ignorantly stumbled on some practice which set free a minute portion of the coiled-up Kundalini. All worship, consciously or unconsciously, leads to this end. The man who thinks that he is receiving response to his prayers does not know that the fulfillment comes from his own nature, that he has succeeded by the mental attitude of prayer in waking up a bit of this infinite power which is coiled up within himself. Thus, what people ignorantly worship under various names, through fear and tribulation, the Yogi declares to the world to be the real power coiled up in every being, the Mother of eternal happiness, if we but know how to approach her. And Raja Yoga is the science of religion, the rationale of all worship, all prayers, forms, ceremonies, and miracles. There is also an American printed edition that has better editing than the Indian version, and has larger type.